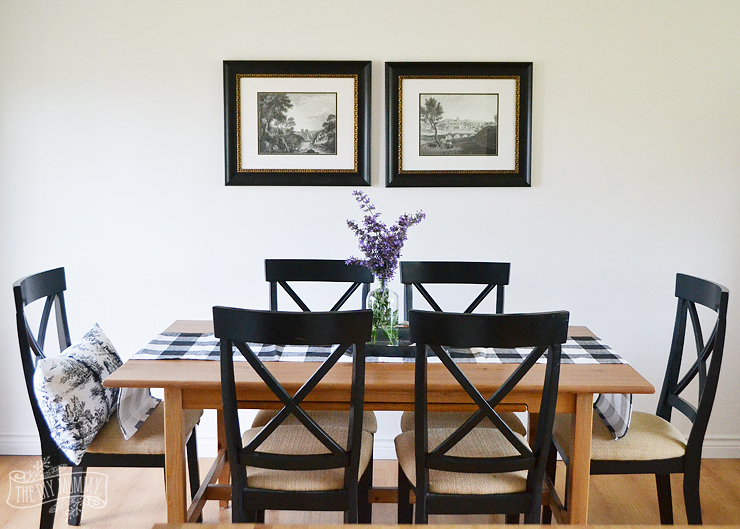 The main rooms in our guest cottage are finally complete! I am so pleased with this little space, and my guests seem to be quite happy with it too. My parents have been staying here for a little while this summer, and we’re so excited to have them so close by. 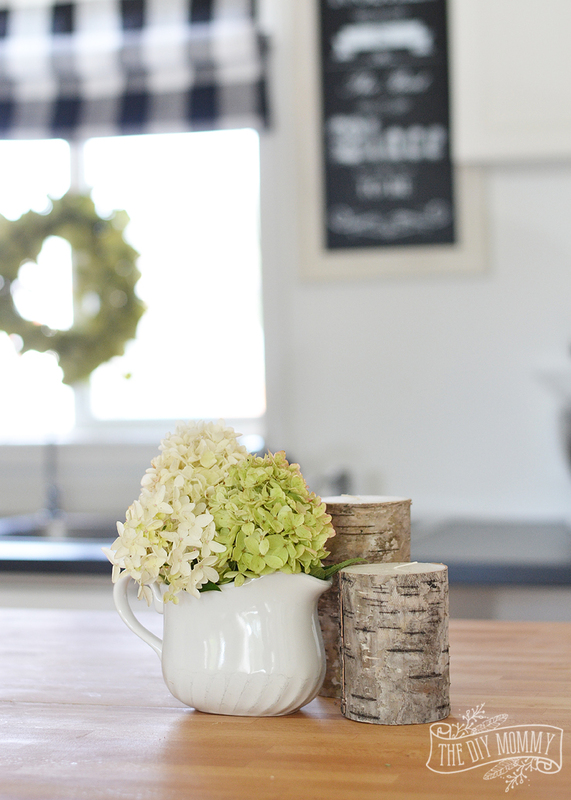 Let me give you a tour today of the final main room in the cottage: the kitchen! We had such a limited budget, but I think the space turned out really beautiful and cozy looking. There’s nothing like some paint, some DIY, and spending a little bit of money on a couple things that make a huge difference! 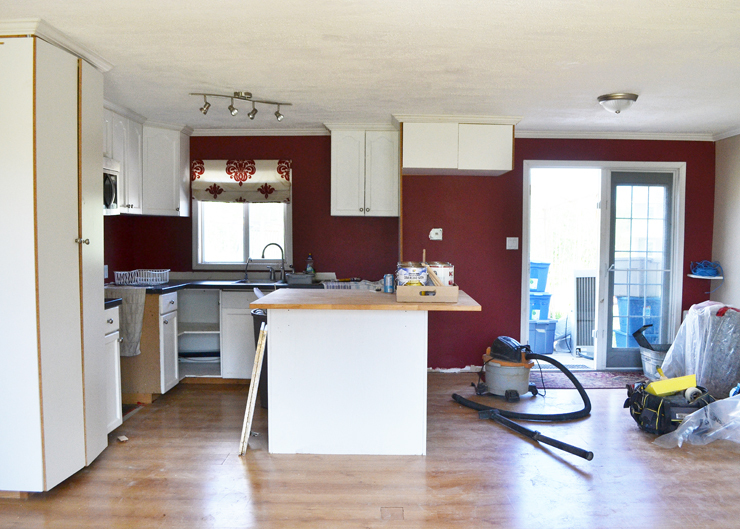 In case you’ve missed it, here’s the story of how we turned the old “garage house” we lived in for the 7 years before we built into a little guest house. 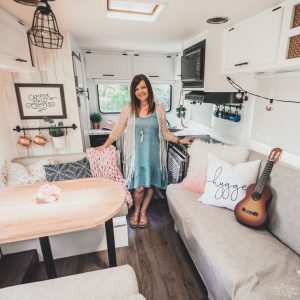 We didn’t want to spend too much money on the whole thing considering it’s a guest house, so we did a lot of DIY in the space and mixed new things with old things. 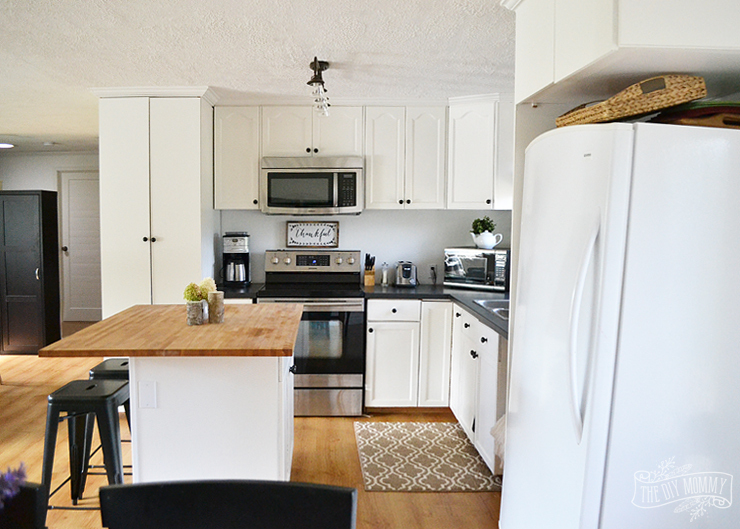 Isn’t it the cutest little kitchen?! What made the most difference in my mind was the paint. I painted all of the walls in the house Simply White by Benjamin Moore, and I painted the cabinets with this colour too. This immediately opened up the whole space, and it helped hide some of the unfinished edges, dents and dings in the old cabinets. 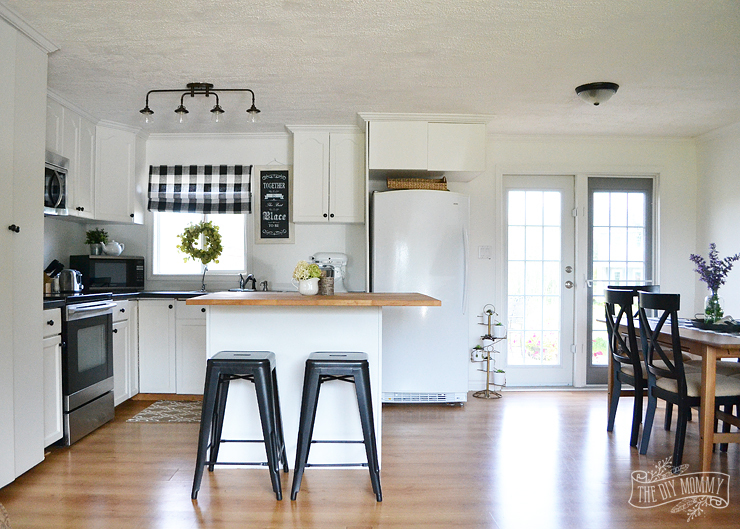 The only new pieces in this room are the light fixture (which I think really gave this room the farmhouse feel we wanted), the kitchen tap (because the old one was broken), the kitchen stools (because we didn’t have any), and a couple inexpensive pieces of art. Aren’t these stools darling? 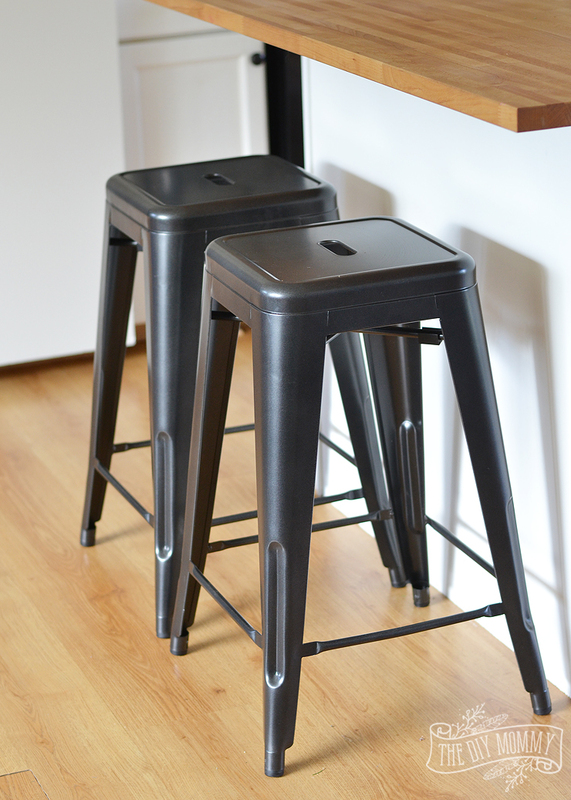 When I saw these Pinnadel Stackable Counter-Height Stools on The Brick website, I instantly thought they’d be perfect in our guest cottage kitchen. 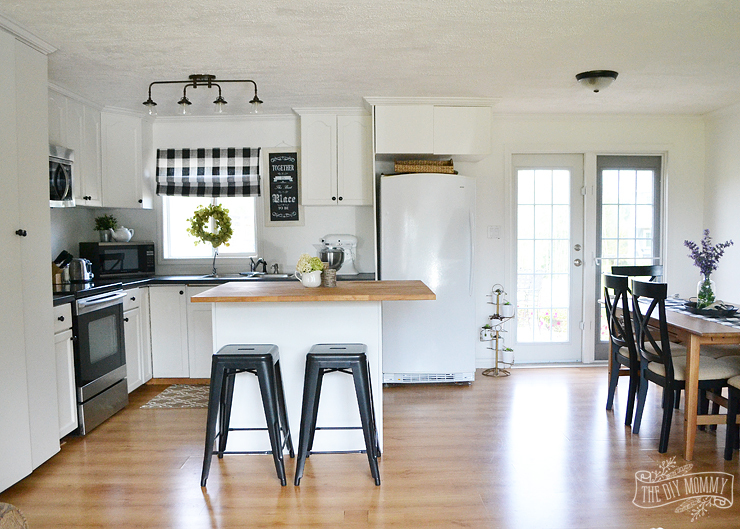 They have the perfect rustic farmhouse look to them, and the black metal looks so good against the painted white cabinets. These stools are really solid in feel, and they look great! 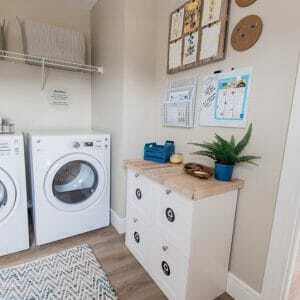 The best part is that they’re not very expensive, so they’re a great choice for our budget-friendly kitchen makeover. The cabinets in here were given to us 10 years ago when we bought our acreage. They were my parents’ old cabinets from their house, and they were the old oak kind from the early 90’s that everyone adored at that time. We quickly painted them when we lived here, but another paint job this year helped freshen them up. 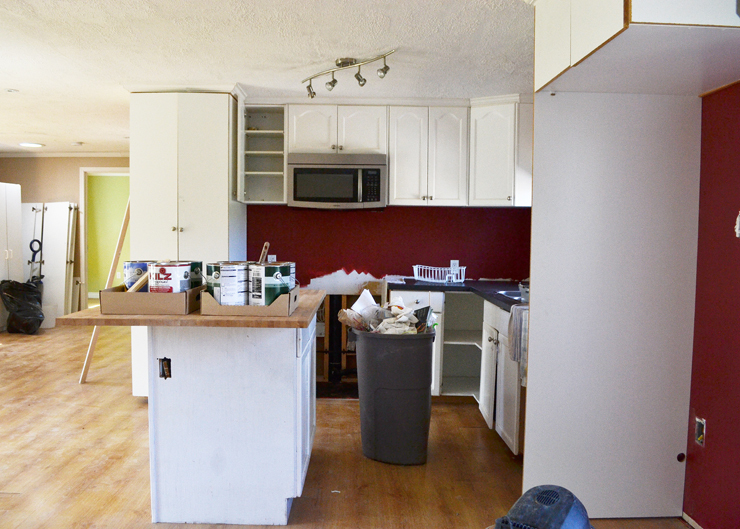 As you can imagine, 25 year old cabinets are a little gross inside. The answer? Peel and stick shelf liner! 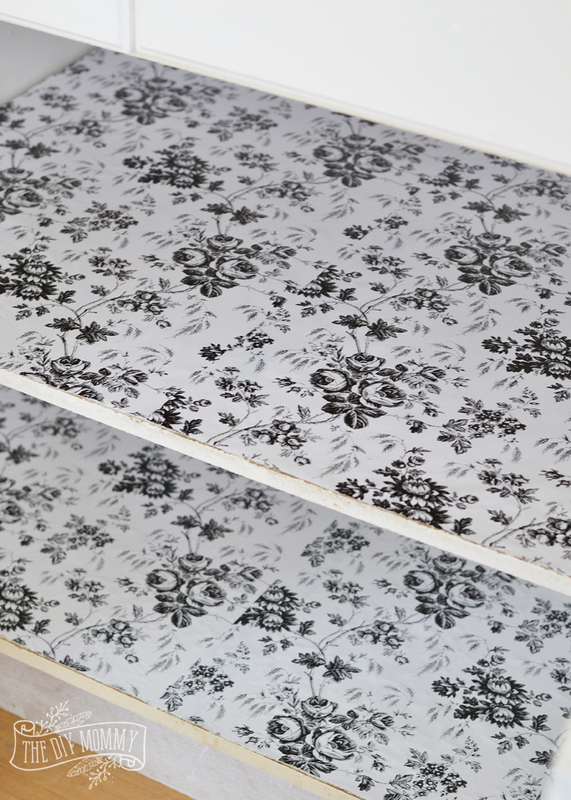 This stuff is so easy to use, and look at the adorable black & white floral patterned shelf liner we found at the dollar store! 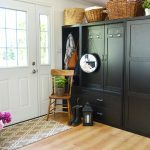 I spray painted all of the knobs with oil rubbed bronze spray paint to suit our black & white theme, and you can read more about that here. 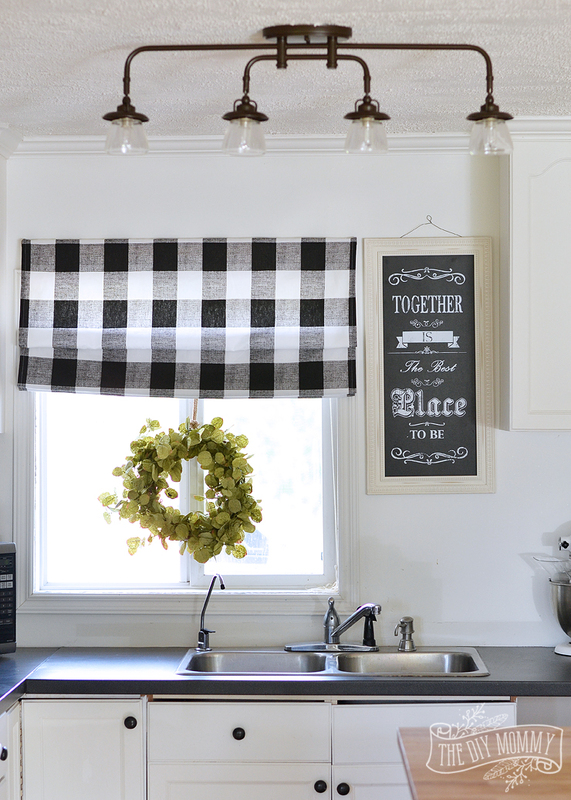 The buffalo check roman shade on the kitchen window helps tie this room in with the other rooms in this little cottage. I made this shade, and I’ll share the DIY for it soon! It was really easy to sew, and it functions really well. 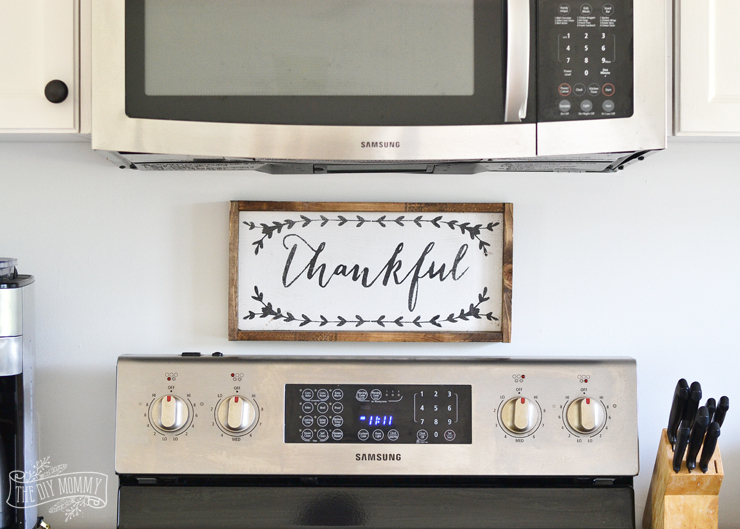 We put our old stove in the cottage, and this sweet little thankful sign is from local artist William Rae Designs. Opposite the kitchen corner is this lovely little dining nook. My parents brought in their old chairs and table, and I think they work so well in the room! 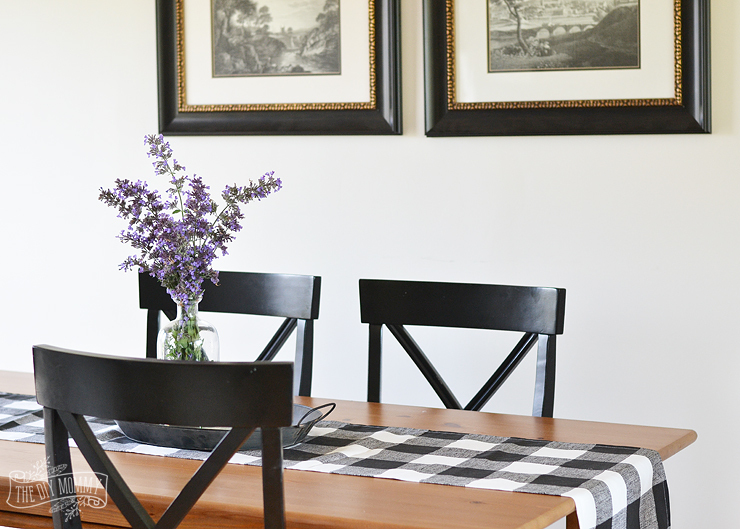 The artwork is also from my parents’ personal collection and it matches our black & white farmhouse theme perfectly. I made a simple table runner from the black & white checked fabric by folding under and hemming the edges of a strip of fabric. 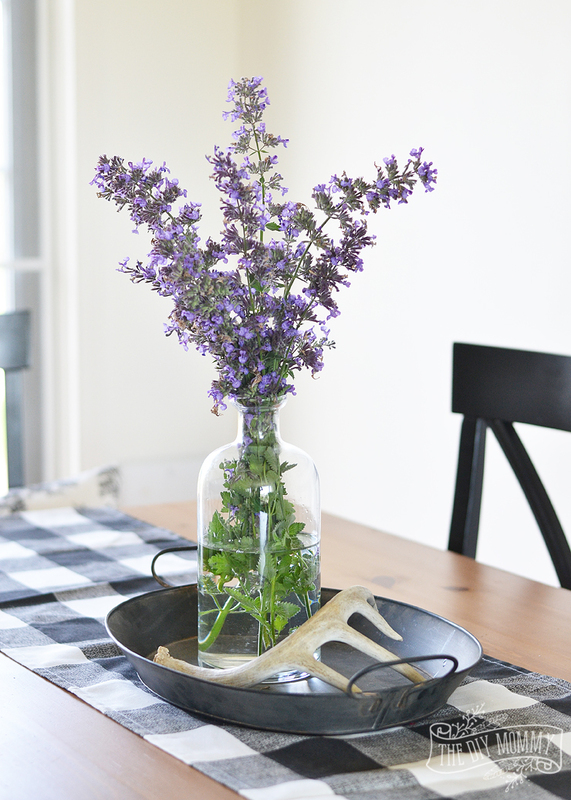 A vase of Catmint from our little garden is the finishing touch to this dining nook. 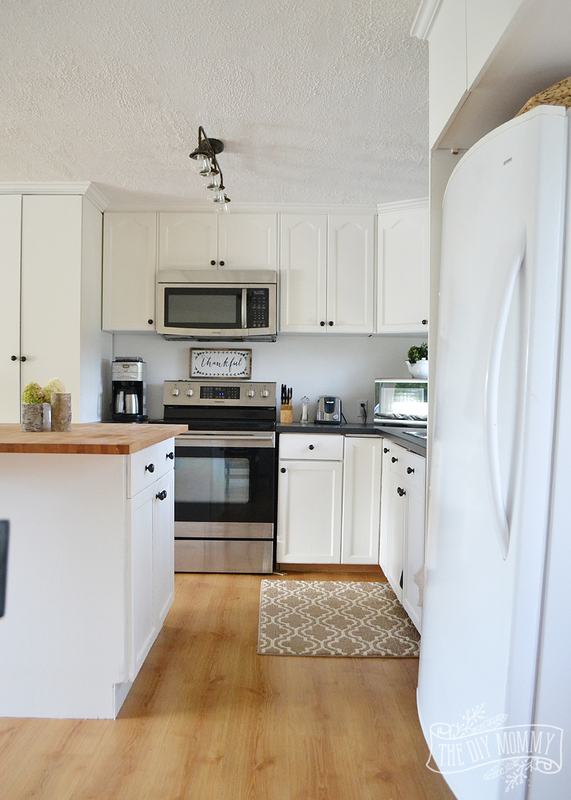 Overall, I’m so thrilled with how this little kitchen turned out. 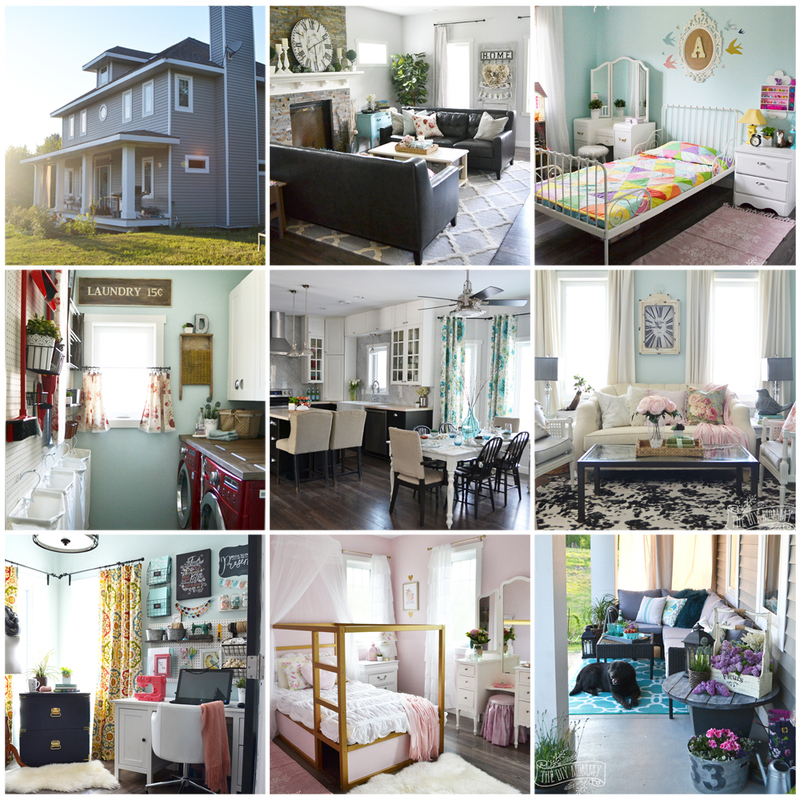 It reminds me that you don’t have to have a huge budget in order to turn an old space into something completely new. The best part is that my guests feel comfortable here, and that makes me so happy! Christina, it’s absolutely perfect!!! 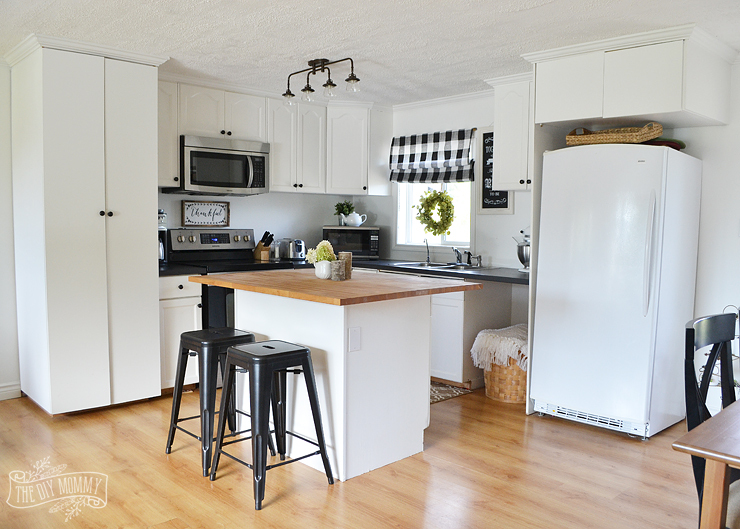 The kitchen looks so bright and beautiful – loving the shelf liner and those metal stools are gorgeous! 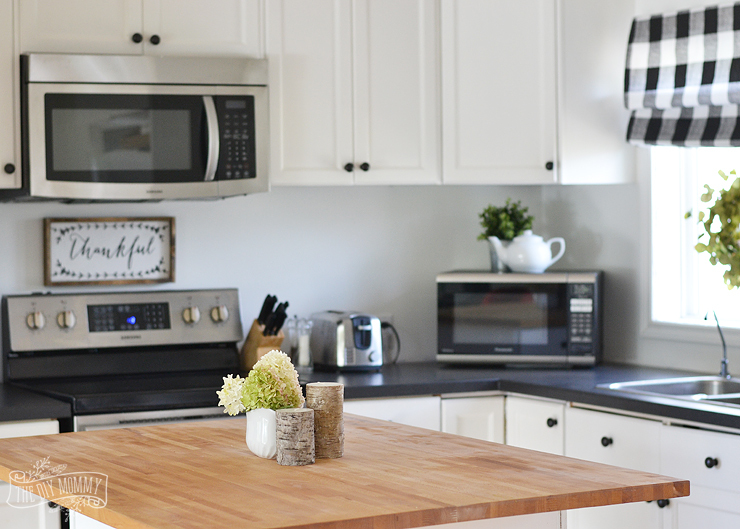 Such a beautiful kitchen, Christina! 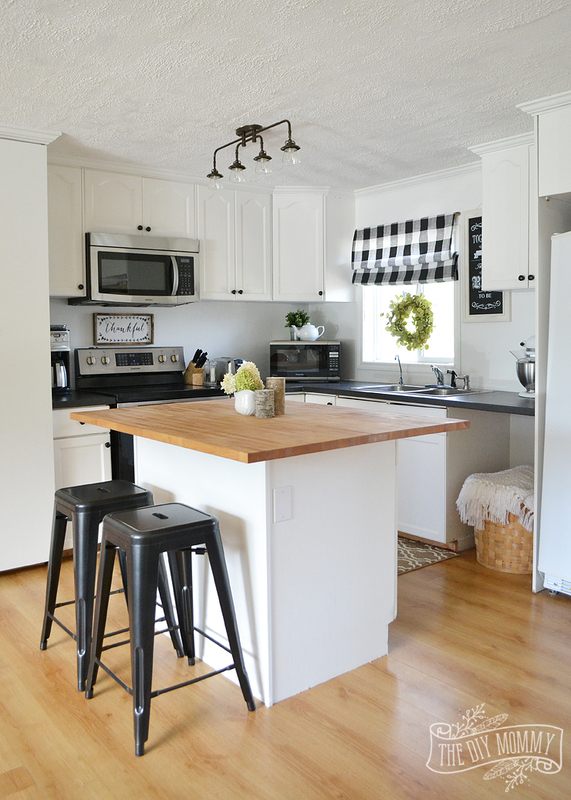 I love white kitchens to begin with, but the décor and the stools, curtain topper all add such charm! Another beautiful space! Where did you find he fabric for the runner and Roman shade. I’ve been shopping now around to do the exact thing. Looks amazing! 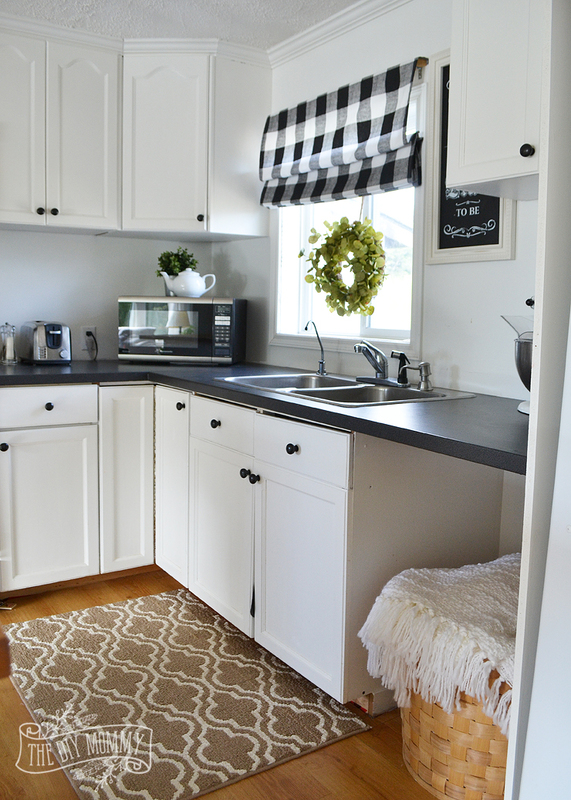 Your kitchen cottage is just beautiful!!!! We are redoing our kitchen in white and blue/with grey undertones. 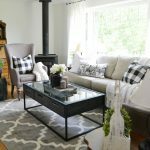 I love the farmhouse feel, and would love to buy the lighting shown in your cottage. Where did you purchase it? Thank you so much for your help. Thank you Nancy for the such kind words. Christina purchased the lighting from Lowe’s. Best of luck on your kitchen reno.